Chapter 3: If they were all insane, it wasn't his problem. 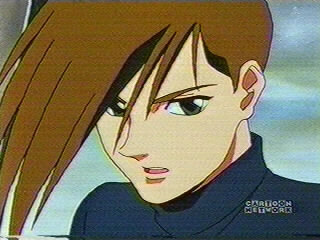 Relena lay quiet and still, listening to Heero breath next to her. She didn't know at what point it had become impossible for her to sleep without him, but it had. He had integrated himself into her heart, her soul, her life, and now even her rest. She didn't mind, though. She always felt better having him near. She thought he must feel the same way; even in hotel rooms with two beds, they always shared. She rested a hand on his smooth, strong shoulder, watching the sunlight dancing over him. He looked younger when he slept, but so did everyone. His hair was tousled, and he looked an innocent, the little lost boy he must have once been. Except she had found him, and over the past year, he had stopped looking quite so lost. It had started when he had first returned to her, showing up to be her bodyguard. He wouldn't leave her alone even if she demanded it, and insisted on being in her room at night. Apparently, he never slept. He had tried to sit in a chair all night, but she talked him out of it. “It’s a large bed.” It wasn't so hard, sharing, sort of comforting really, and finally they had given up any pretense. They went to bed more or less at the same time, together, and he slept next to her, under the covers. Ostensibly he was there to protect her, but there had been nights when Relena woke to find his arms wrapped tight around her, his face pressed into her hair and neck. Sometimes he was breathing fast, shaking, just woken from some nightmare. She longed to comfort him more actively, but knew he couldn't allow himself that much weakness in front of her yet. She could serve him better by laying still and pretending sleep, so that was what she did, her heart breaking as he cried his tears into her pillow. Oh, Heero, she sighed to herself, and transferred her head to his shoulder, and her hand to his hair. She loved him so much. She couldn't imagine not having known him, now, even though she remembered the day they met like it was yesterday. And still, they were pretending. At least now they were playing house instead of enemies, but neither were very convincing. Still sleeping, he turned his head toward her, like a flower seeking the sun. His chin grazed her forehead. She let her arm rest along the curve of his face, his neck, his chest. He was beautiful, her prince. She closed her eyes and rested with him again. Sally woke slowly, but aware that something was off. What was it? Oh yes. She was at Quatre's retreat. Sleeping with Wufei. Stupid dream. She squeezed her eyes shut, then forced them open again to check. Nope. It was still happening. Damnit. Last night, Sally hadn't been able to sleep. Still furious at Wufei, in the middle of the night she'd tiptoed down to his room, full of righteous anger. He was still up, and answered her knock promptly. He was dressed only in loose white pajama pants. His hair was undone. And he was wearing glasses. Her stomach had flip-flop at the sight, and she forgot the speech she'd been working on. "Yes?" he said, but there hadn't been a sneer in his voice. Sally was reminded he was only four years younger then she was, that he was an adult now. Very definitely a man. It had all gone downhill from there-- or uphill, depending on where you were standing. Sally wasn't sure where she was standing. His creamy skin looked dark against her pale arm. His hands didn’t have many callouses on them, reminding her he had been a scholar longer then a warrior. It was possible it was his lips resting against the vertebra in her neck. Oh God and Nataku, she thought, what have I done? She knew what she had to do now. Get the hell out. She had to leave. But what would she do when she saw him again? Pretend it never happened? There was a large part of her that was reluctant to hurt Wufei, but she was also wondering if it would hurt him. What had this meant to him? Did it mean anything to him? Well, she had to ignore the part of her that wanted to stay curled up next to him and be his onna. Sally carefully slipped out from under his arm, leaving it stretched out across the bed. She pulled on her pajamas and eased the door open as little as possible. She pressed it closed with the quietest possible snick. She jumped, her heart pounding *caught, caught*. Trying to breathe, she found herself face to face with Trowa, blinking calmly, although puzzled. "I..." how could she explain this to Trowa when she couldn't explain it to herself? "Don't tell anyone" she hissed. Sally nodded back, still hesitating, then turned and ran to her room. Trowa shrugged and continued on his way. If they were all insane, it wasn't his problem.